I went a little heavy on the liquid in this stew — stoup, if you will — because it is one of the best parts. I love soaking up all that extra broth with a chunk of crusty bread! I’m pretty sure it’s good for my soul on these cold, miserable winter days 😉 If you want more stew and less stoup, just reduce the broth by 1/2-1 cup. This Slow Cooker Garlic Parmesan Chicken Stew is bound to be your new favorite winter comfort food! 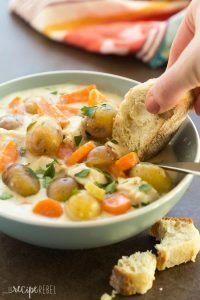 It's hearty, creamy, cheesy and loaded with vegetables! The crockpot makes it an easy weeknight meal. Add potatoes, chicken, celery, onion, carrots, garlic, salt, parsley, thyme, pepper, and broth to a 4-6 quart slow cooker. 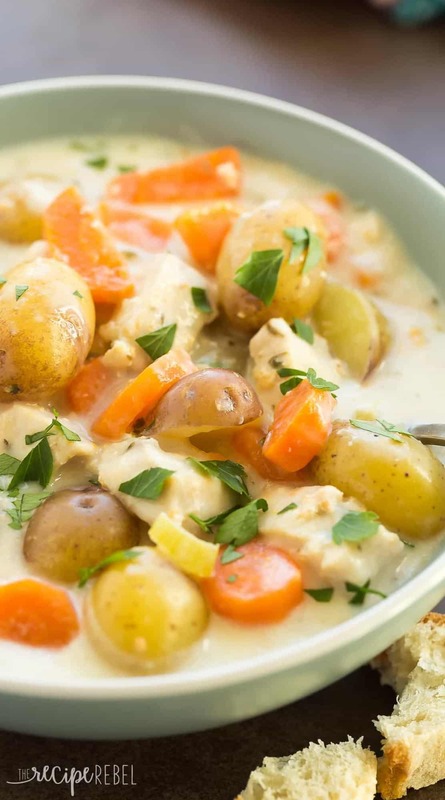 Cover and cook on low for 4 hours or until chicken is cooked through and potatoes are tender (this could take up to 6 hours depending on the temperature of your slow cooker -- cutting them smaller will speed up cooking time). *I have cooked this stew on the stove top and it works just as well! If you're in a hurry, simmer everything except cream, corn starch and Parmesan in a large pot until potatoes are tender. Combine cream and corn starch and stir into the pot with the Parmesan, continue cooking until thickened. ** Please note nutrition information is estimated and will vary depending on the brand of products you use. Can you freeze this recipe , after it’s cooked? I have, yes! You just have to use high fat dairy (cream) as low fat dairy doesn’t freeze well. A great meal on a cold winters night at Champion Corner. I upped the garlic a bit, added some other root veg that I had and used sour cream for the dairy (I wasn’t running out for milk or cream) and it turned out AWESOME. Served with fresh baked multi-grain bread warm from the oven. My hus loved it, and its healthy too! Thanks for the inspiration! p.s. for lunch the next day (today) it was equally good. I’m so happy to hear that Larry! Thanks for the tip about using sour cream! Yes definitely! Generally I will cook on high for half the time as on low. Attempted to make this awesome looking recipe. Mine doesn’t quite look the same. Wish I knew how to send you a pick of it. What a great comfort food soup for these cold winter days! I am drawn to anything with Parmesan and garlic in the title. This is so easy and so comforting! This is the perfect comfort food for this freezing cold day! This is just what I need on a cold winter night! Slow cooker meals are the best and this one was so easy to make!! Hi MaryAnn! I’m so happy to hear you liked the stew! I actually have a 6 quart Hamilton Beach slow cooker with a meat probe in it — it is great and takes a lot of the guess work out of cooking meats! Made in my Instant Pot using instructions from another recipe and it came out great!! Add all initial ingredients like crockpot recipe & add a pinch of red pepper flakes. “Select Manual/Pressure Cook, high pressure, for 3 minutes. I love that! I need to try this one in my Instant Pot soon! Thanks! This is exactly what I was looking for – Instant Pot directions! Making it tomorrow night! The time is only 3 minutes to cook the chicken breasts too? Did you have to cut them first? I was just thinking I needed IP instructions for this recipe! Perfect on this cold, rainy night! I didn’t have enough broth so I substituted one bouillon, a can of cream of chicken and 2 cans of water for the broth. It made it thick and delicious! Thank you for the recipe! Yummy yum yum!! Made this amazing stew for dinner tonight! Followed directions exactly. Don’t add canned soup, I think it would ruin all the amazing flavors. It is very different from my other crivk pot recipes! Thank you!! Thanks Shelley! I’m so happy to hear you enjoyed it! Made this for supper tonight. Turned out amazing! Tossed whole chicken breasts and all the veggies chopped into the slow cooker. I used chicken broth and added a stick of butter to make it richer. Before adding the cream and cheese I shredded the chicken. I used whole cream and an Italian blend cheese because that’s all I had. Turned out amazing, the whole family loved it! I’m so happy to hear that! I’ve never tried adding butter before — I’m definitely intrigued by that! so we may not need to use cornstarch. It’s a good recipe, looking forward to it. I’m with you on the bread. A big slice of homemade bread in the bottom of the bowl is how I grew up eating stew. My short experience being gluten free last year drove me crazy. This old lady can’t live without grain. Dairy turned out to be the real issue. That was tough,but ice cream was hardest. The substitutes for dairy are far better than subs for my beloved grains! Happy Holidays from Boston Ma. Where it is cold & rainy. MA & Hubs. I cooked it high for 45 min at the start because I put in frozen chicken and wasn’t sure if it would show the cooking of the potatoes, then dropped it to low for 3.5 hours, before turning it back to high for the last part of the recipe. I also wasn’t sure what to use for cream, so I used condensed cream of chicken soup. It turned out good. (Picky) Kids and hubby loved it though I felt it a bit salty, so I’d probably half the salt added at the start, or use low sodium broth. Potatoes were perfectly tender. Can I use an Instant Pot? Would you know the cooking time? You definitely could! For cubed chicken and veggies with broth, I would do maybe 3-4 minutes. Then add the cream and Parmesan afterwards. I hope that helps! This was delicious!! I substituted the carrots for broccoli but aside from that did everything else the same. Will definitely be making again!! I made this last night and it was delicious! I served it to my whole family and everyone liked it. We had french bread on the side and it was yummy dipped in the broth. 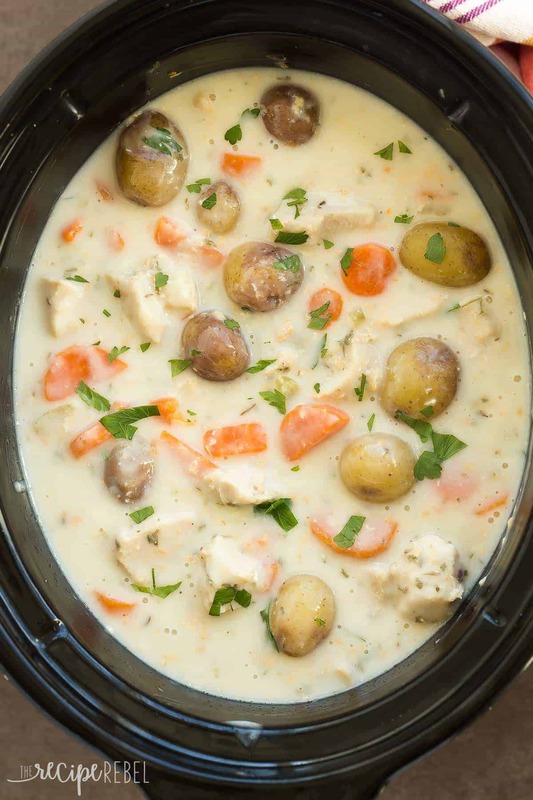 Next time I make this soup, I am going to leave the chicken breasts whole and cook in the crockpot for 8-9 hours on low instead of 4-5…. and then shred the chicken into the soup before turning on high for that last 30 minutes. Reason being, the potatoes and the carrots do not get soft enough with only 4-5 hours. They were soft but not soft enough… they needed more time. I read another review that said the same thing so I even cut my potatoes and carrots small and/or thin hoping that would help, but it didn’t. You truly do need more time. However, the flavor of this soup was DELICIOUS! Thanks Lisa for that note! It definitely does depend a lot on the size of your veggies and the temperature of your slow cooker. Could I use almond milk instead of cream or regular milk? I haven’t tried, so I can’t really say how it would turn out. You probably can, but there will definitely be a different taste. Can you use grated Parmesan? I made this yesterday and it’s fantastic! This will be a recipe that I make often. Thanks so much! Question. . . Approximately how much chicken (oz, lbs) do you use. You say 3 breasts but I’ve purchased some chicken breasts that are gigantic. I like that you added the nutritional information, but that could change depending on the amount of chicken. Hope that makes sense, thanks. When you say cream do you mean heavy cream? Heavy cream works, or half and half, or anywhere in between 🙂 It just depends how creamy you want it! Yes, that’s a great idea! I’m so glad you liked it! This was delicious! 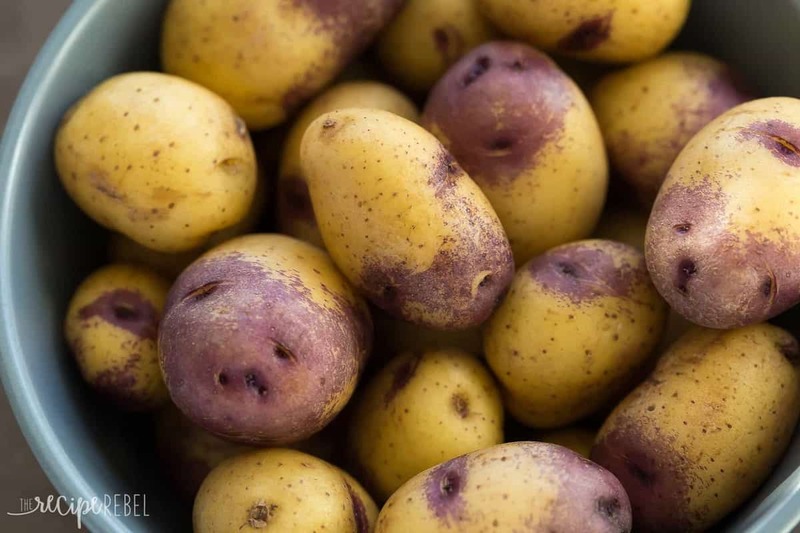 I used some of the small potatoes, and then cut up some russets into small pieces to supplement. Overall the flavor was really good, it was super easy, and it was filling and satisfying. Just made this last night and I thought it turned out great! I used fresh thyme and dried Italian seasoning in place of the spices. I also added frozen green peas when the cream/cornstarch mixture was added. My husband doesn’t like meals from the slow cooker and he was impressed! I’d toss a parmesan rind in this as well, it makes SUCH a good savory foundation that you can’t get with anything else! What is a parmesan find? A Parmesan rind is just the end of a chunk of Parmesan — the tougher part that you wouldn’t eat. You can add it in for extra flavor and then scoop it out before serving. I made this tonight intisipating a good dinner. Oh, was I wrong. The vegetables weren’t fully cooked, cornstarch did not thicken at all. When you have to microwave the potatoes in order to eat the dish, you totally loose interest. I had it in for 5 hours, and as I am typing having to cook it on the stove, hopefully not having to throw away. I will tweek recipes but not sure how I can change this one. Have had better, lots better. I’m sorry to hear that Dawn! Every slow cooker is different so it’s really hard to say, and all potatoes are a little different size. I’ve had a ton of positive comments on Facebook so I’m surprised that you didn’t like it! can i cook this for more than 4 hours in the slow cooker, or will everything be too soupy and soggy? One of my favs growing up was my mom’s ham and bean soup. We always had it right after Christmas. My mom would use the ham bone leftover from the Christmas ham. She would soak the beans over night. She would start the pot on the stove in the morning and the house would smell so amazing! I just couldn’t wait for supper. She would make corn bread to go with the soup. Butter would melt on the warm corn bread!! My mom would put a splash on vinegar in her soup, so I had to try! To this day I always need a splash of vinegar in my bean soup! Oh that sounds incredible! Bread and soup is one of my all time favorite meals! How much is a serving? Thanks for sharing. I can’t wait to try it. I believe in this case it may be 4 oz. 3 cups of fluid is 24 oz and divide this by 6 and you would get 4 oz. a 1/2 cup. If you wanted a full cup-8oz, it would be approximately and slightly over 500 calories. In baking dish layer 1/2 ground beef, top with 1/2 of sliced potatoes and 1/2 of sliced onion rings. Top with 1/2 of soup/milk mixture. Bake uncovered at 350 until potatoes are cooked thru (approx 1 hour). Stick knife through to test for potato doneness. (My dad adds a layer of canned corn, but he’s always been a rebel like that). I’m a purist with my garbage. LOL. Hahahaha. I meant to say ignore the name it’s delish, not its selfish. LOL. I love potatoes roasted the best. This recipe will be made very soon!!! Oh so many favorite potato dishes. Cheesy scalloped potatoes, twice baked potato, love the little potatoes to put in cast iron frying pan dinner with chicken onions and carrots. baked in the campfire. roasted on the barbecue. soup,borscht, stew, hashbrowns. Off subject……did you teach History at Blacktown TAFE in the Eighties ?? Parmesan Potato Rounds from a Taste of Home magazine is by far my favorite potato dish.